In view of the growing demand for our services, we sought a solution for an on-site office and tools area. We determined that the best option was to have location fixed and mobile on site. 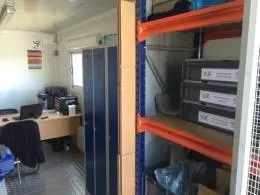 In recent months we acquired a container that has been fitted partially with an office space and storage for small parts, which also serves as a shipping container for materials, as well as a workshop and laboratory. Even though the surface area is relatively small, it has been optimized to provide an efficient response and quality to our customers for that space. 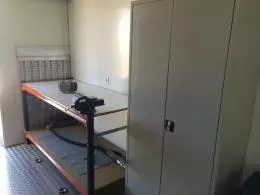 This is a great solution because we can move it to anyone in any corner of the world for different jobs and duration and adapt the interior each tome to fit the specific needs of the job.